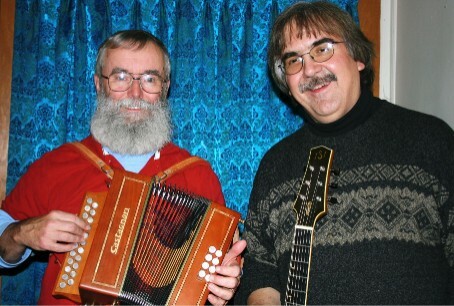 Celtimorphosis is a critically acclaimed Celtic jazz fusion duo consisting of Brian Hyland on Anglo and English concertinas, pennywhistle, harmonica, flute, accordion, bodhran and bones, and Chris Woodard on guitar and mandolin. Brian and Chris began their collaboration in 1993 with the sound track for the Emmy-nominated Civil War documentary, "Helmira 1864-1865: The Andersonville of the North" produced by WSKG-TV. Since 1995, they have recorded for Orchard Park Recordings. In the summer of 1999 they helped launch Orchard Park's Orchard Beat label. “Helmira 1864 - 1865: The Andersonville of the North” (WSKG-TV,1993): Sound track for the Emmy-nominated Civil War prison documentary. Strathspey” and “The Sally Gardens” from “Celtic Traditions. "Season of Hope and Joy" (Orchard Beat Records for Logos Bookstore, 2013): Joined by Meredith Bocek on harp and Timothy Ball on violin. Brian played on nine tracks and arranged "Away in Three Mangers." To contact Celtimorphosis about bookings, please click here. Thank you!